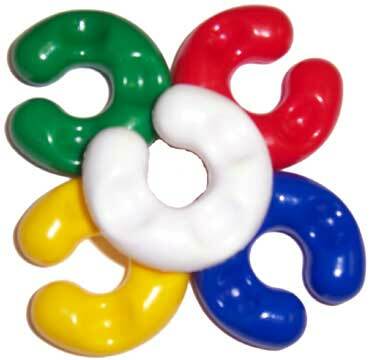 Pack of 5 semi-hard plastic "parrot donuts." These are great foot toys for larger beaks, or can be placed on older toys to make them "new" again. Use your imagination with these ... hang from the cage bars or put a few together for creations of your own! Also, great to have on hand as replacement parts for toys that originally have these parts like the Love to Chew.